Every mother will tell you how fast that first year will fly by. Babies first birthday is a once in a lifetime event, and everyone wants to make sure it’s unforgettable. 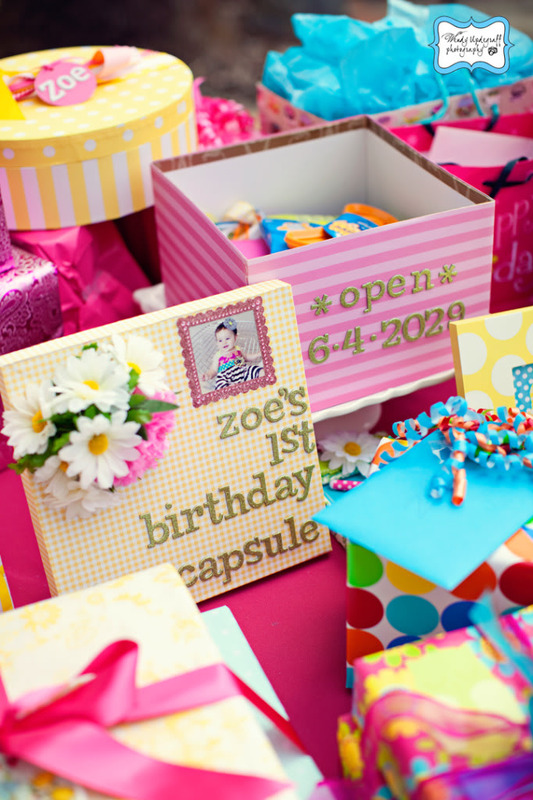 Planning the perfect party doesn’t have to be stressful, so we’re sharing some of our favorite tips and creative ideas for throwing a memorable (and stress free) first birthday party! 1. Take photos from throughout the year and create a number one collage for on the wall. 2. Start a tradition on her first birthday to do a yearly Handprint Canvas Print. You can display these adorable keepsakes on the wall to see the changes throughout the years. 3. Fill their crib with a ton of balloons in the morning for some first birthday photos! 4. 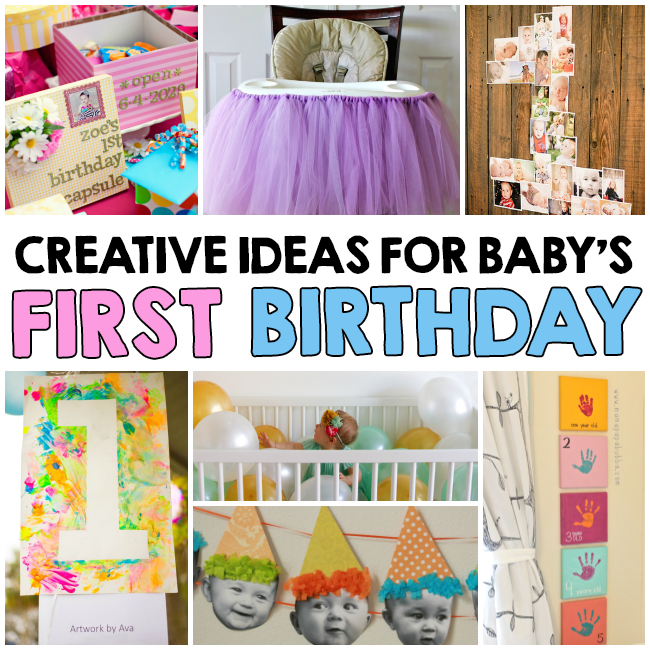 Start a first birthday time capsule. Allow your guests to write a personal note. It can be about their hopes and dreams, about them, about her, or about the year of her birth. Seal the time capsule tightly to be opened on her 18th birthday. 5. Make your own no-sew high chair tutu, they make the perfect photo prop for the smash cake session. 6. Make easy thank you cards using baby’s handprint. 7. Personalize Baby’s First Birthday Party by displaying a finger painting masterpiece created by the birthday child. 8. 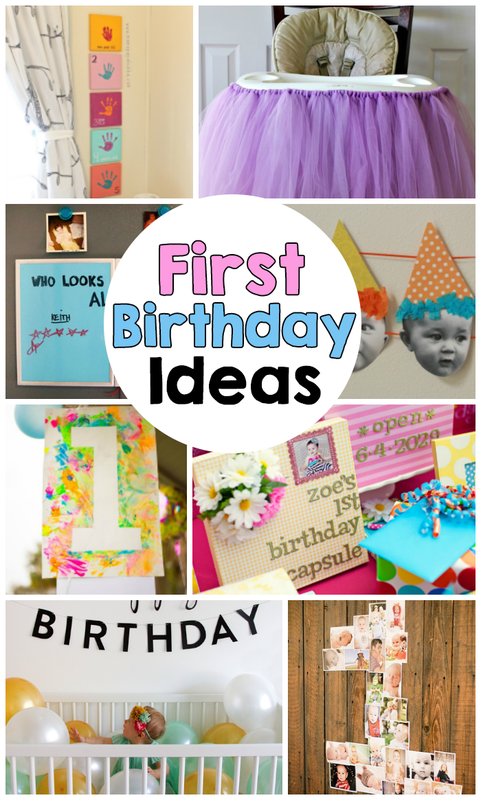 Make a super cute DIY personalized birthday banner using your baby’s facial expressions. 9. Have baby pictures of both the parents so guests can see who looks like the baby more. 10. And most importantly keep it simple! Babies“R”Us was our one stop shop for everything from when we were preparing for our kids to be born to preparing for their first birthday. If you’re planning for a first birthday it’s a good idea to stock up on those necessities that I promise you, you will use! Make sure you have Pampers diapers on hand so you’re baby’s dry and Dreft to take out those stains from your smash cake, juice, or those party snacks. Babies“R”Us and Pampers want to help you celebrate and are teaming up to ensure you have everything you need, from party favors and birthday clothes, to Pampers and Dreft, to make your day unforgettable. Come in to your local Babies“R”Us store to prepare and celebrate this milestone with fun activities, prizes, giveaways, and inspiration for planning your baby’s big day. Activities will include story time, decorate your own Geoffrey growth chart, photo prop fun and so much more! You can also learn about and join Geoffrey’s Birthday Club and create Baby’s first birthday Wish List too! One winner will receive a $50 Babies“R”Us gift card, Pampers Wipes, and a birthday prize pack! Open to U.S. only. Try to keep it simple so you can enjoy the party and your baby. My best tip is if you have a large family on both sides, have 2 parties, so its not to overwhelming for the little ones. I have found that having a theme helps to make things easier. My tip is to keep it small and simple. Set a theme, take photos and enjoy some quality time with the birthday baby! Prep the night before so you can enjoy the day! My best tip for throwing the party is to let lots of people help you! My best tip for throwing a first birthday party is to plan ahead and not be afraid to ask for help. My best tip is to keep it relatively small and take lots of pictures.